15th Binational Policy Forum on Migration and Global Health, San Francisco & Oakland, Ca. October 5th 2015. Click here to see topics covered. Click here to see Public Policy recommendations produced during workshops. The 15th Annual Binational Policy Forum on Migration and Global Health took place on October 5th at the California Endowment located in Oakland, California. 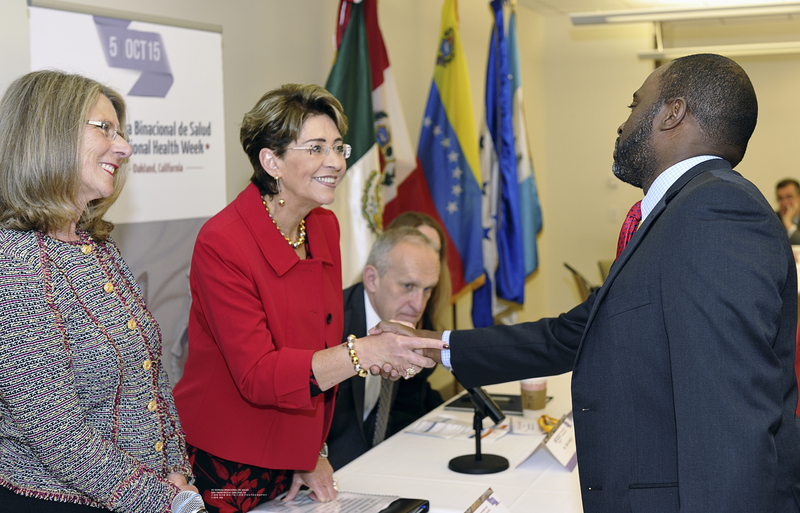 More than 400 people representing close to 280 public, private and academic entities from the United States, Mexico, Guatemala, Honduras, Colombia, Ecuador, Peru, Venezuela, Brazil and Chile participated in this, the inaugural event of the XV Binational Health Week. The forum was inaugurated by the Secretary of Health in Mexico, Dr. Mercedes Juan and the Secretary of the California Health & Human Services Agency, Diana Dooley. Both dignitaries expressed that the health of migrants is a priority for both countries, not only due to their contribution and effect in their respective countries, but also because of the opportunities and challenges that these migrants and their families face in regards to health. Dr. Kim Wilcox, Chancellor of the University of California, Riverside; Melissa Stafford Jones, Regional Director for the U.S. Department of Health and Human Services; Francisco de la Torre, Executive Director of The Institute of Mexicans Abroad of the Ministry of Foreign Affairs; and in representation of the rest of the Latin American countries who participated in BHW, Roberto Archila, Consul General of Guatemala in San Francisco, also participated in this part of the event. In addition, Assembly-member Tony Thurmond Representing the 15th California Assembly District and the California Latino Legislative Caucus presented two proclamations that emphasize the importance of BHW. The academic portion of the forum began with Dr. Marc Schenker, professor at the University of California, Davis, who presented a global vision of migration, with an emphasis on the North American continent. Special attention was put on the health challenges that migrants face, with an emphasis on inequality. Afterwards, Matías Jaramillo, General Director of Planning on Population and Development, National Population Council of Mexico (CONAPO) presented the 2015 report on “Migration and Health: Profi le of Latin Americans in the United States”. This document was produced with the collaboration of CONAPO, the Health Initiatives of the Americas, a program of the UC Berkeley School of Public Health, the UCLA School of Public Health and the UC Davis School of Medicine. Finally, Dr. Cuitláhuac Ruiz Matus, General Director of Epidemiology of the Mexican Secretariat of Health described the challenges and successes that Mexico has faced in light of the recent epidemics related to mobile populations. During the lunch, offered by the Mexican Secretary of Health, eight binational research teams funded by the Research in Migration and Health Program (PIMSA, for its acronym in Spanish) presented posters of their research fi ndings in different areas related to migration and health. The academic portion of the event concluded with a plenary session where moderators from each topic presented a summary of their workshops and the public policy recommendations. 1. Comprehensive immigration reform at the federal level which guarantees basic medical insurance and service to all newly documented individuals. 2. Joint U.S. and Mexico efforts to support and fund local efforts of education, engage the Latino population in citizenship and voter registration drives, and encourage community participation in each. 3. Support legislation directing appropriate state agencies to set aside funds as community contributions from key HMO merger agreements in California. 4. Following the recommendations that came from the California Endowment in their campaign “Health for all/Salud para todos”, the process in California has begun to provide services through the MediCare program to undocumented children, but efforts must continue to encourage health for all. Not only access to insurance, but appropriate access to health care services with support from community health care services and other institutions to keep them out of emergency rooms. 5. Work closely with Ventanillas de Salud and other efforts being made by the government of Mexico aboard to channel resources and efforts around migrant health issues, specifi cally chronic diseases prevention. 1. Bring to primary care the public policies that Mexico has, both in the health and education sectors, in order to reduce the levels of pre-obesity and diabetes. 2. Increase public awareness of the risks that come with a poor diet and high sugar intake through community health workers and health professionals. 3. Reduce obesity and obesity-related diseases by implementing small projects such as farmers markets and physical activities in schools. 4. Provide adequate information about the risk of kidney disease in relation to diabetes in order to prevent complicated and more expensive kidney transplants and treatments. 1. Develop binational investigations to follow-up with patients that are diagnosed with latent TB in high risk populations. 2. Develop collaborations on both sides of the border with diverse health care providers, thereby maintaining and solidifying the existing channels of communication between both countries. 3. Consider the border as an area of high prevalence of disease and vulnerability due to the constant fl ux of people. Develop conjoined vigilance efforts as a point of high priority for mutual benefit. 4. Develop databases accessible to researchers and program directors on both sides of the border. 1. Increase visibility regarding occupational health by collecting data at governmental level, clinics, and other ways such as media, to look at the impact of immigrant workers. Visibility can be an effector of change and strong recommendations to look at the conditions that exist, whether it is a single case, industry or population. 2. Recommend measures to give equal protection to immigrant and non-immigrant workers. 3. Work binationally. Many of the issues are common with U.S. and other Latin American countries and there is a need to work together to collect data and come up with solutions to address these disparities in the workplace. 1. Address the issue of violence at a multi-sectoral level, throughout lifespan, and give more attention and visibility to the resource of masculinity. 2. Continue exploring the protective factors that migrants have in relation to violence. 3. Include families of migrants in research regarding migrant violence and mental health. 4. Recognize the need to address oppression and the violent factors in society; learn how to document and investigate them in order to be able to promote the findings. 5. Address the stigma associated with mental health, as an issue that needs research and documentation as well as actions to help reduce it. We would like to thank the efforts and work achieved by the organizing committee; composed of the Mexican Secretariat of Health, the Institute of Mexicans Abroad, the Mexican Embassy in the United States, the General Consul of Mexico in San Francisco, and the Health Initiatives of the Americas, a program of the UC Berkeley School of Public Health. Besides this, we would also like to acknowledge all of our volunteers who worked countless hours towards making this event possible.